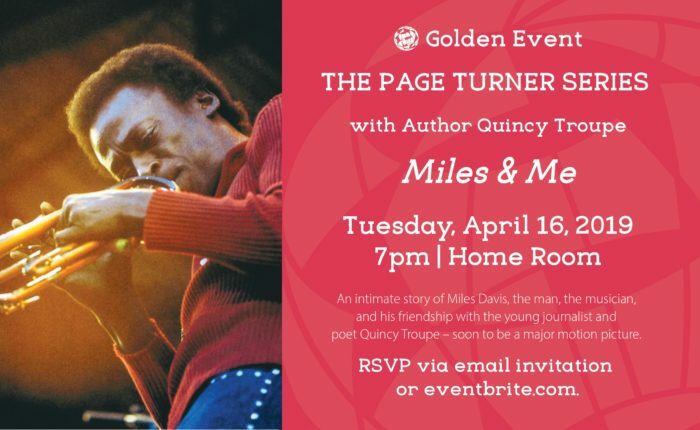 Join us to go behind the scenes in this story about legendary musician Miles Davis and his friendship with his biographer Quincy Troupe, a poet, activist and journalist. Troupe’s candid account of his friendship with Davis is a revealing portrait of a great musician and an engrossing chronicle of the author’s own artistic and personal growth. Miles and Me describes in intimate detail the sometimes harrowing processes of Davis’s spectacular creativity, and the joys and travails posed by Davis’s passionate and contradictory temperament on the friendship between the two men. Miles and Me shows how Davis, both as an artist and as a black man, influenced Troupe and whole generations of Americans while forever changing the face of jazz. The book will soon be made into a major motion picture.